Want to add some oomph to your social media posts – not to mention increase your chances of your posts being seen, and engaged with? Of course you do. If you’re spending your time, energy, and resources on social media, let’s make sure you’re getting as much action and engagement out of it as you can. There are people out there right now who would love what you’re sharing, but they need to find you!. We all know that hashtags can help you do this, and I’m guessing you have a trust set that you’re using to help people in your industry or potential clients find you, but are you also utilizing thematic hashtags associated with days of the week (beyond #ThrowbackThursday)? If you’re hoping to grow your social media followers and engagement, and decrease the amount of “what should I post now” moments in a week, read on, save this list and swipe these hashtag themes! PS – Don’t be afraid to make them your own. For instance a #TransformationTuesday post can be about a health or wellness change you’ve been through, or it be an anecdote, tip, or story about how you transformed your business or your life. Just make sure it’s authentic and would “speak” to your ideal social media audience! Now let’s get started, I’ve included a few tips on how to use them below and then you’ll find the good stuff – a list of hashtags you can begin using today! My personal goal is to post approximately 2x a day on Instagram if not all my feeds (sometimes I win this battle, sometimes, I lose, but it’s my goal), and thematic hashtags keep the idea well full. Not sure what to post? Run out of Instagram-worthy photos? 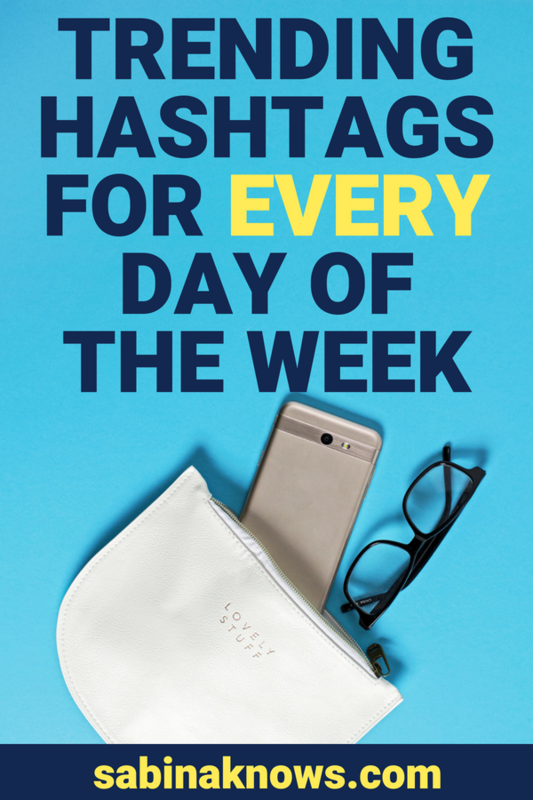 Rely on a days-of-the-week hashtag to bring your feed back to life. While you don’t have to participate every week, I encourage you to experiment with them, analyze how different tags perform, how your audience reacts, and let’s be real: how much you enjoy using them, and move forward accordingly with the hashtags that feel right for you! These hashtags are often widely used and trending. That means by participating in them you’ll increase your chances of engaging with others, including newbies to your feed. Not everyone will be searching or engaged in hashtags that are very specific to your brand unless they are already deeply engaged in it, so by using these weekly hashtags you’re joining a social media “conversation” that has built in participants – and lots of them – already! They allow you to share a new side of your business and your personality – which is vital to social media and business growth. #MCM (Man Crush Monday) or #WCW (Woman Crush Wednesday) are great examples of this. No, you don’t have to post a photo of Michael Fassbender (though I won’t stop you my friend) or Shania Twain, you could also share a photo of a man or woman who inspires you, supports you, is a part of your team, is an influencer or colleague you admire, or even a family member. Use them strategically and you’ll be able to connect with people you may not know personally and create new relationships. Or, go right ahead and use them to share your celebrity crushes from time to time – no one will fault you – just make sure it’s in line with how you run you or your brand’s social media feed! #WaterfallWednesday (Yes, this is really a thing, and if you don’t want to participate just enjoy the posts for insta-relaxation). Do you have any “days of the week” hashtags I should be adding to the list? Share them in the comments below! If I add it to the list I’ll be sure to give a shout out (and link back) to your feed!